I’ve set up a new blog called Capturing the Threads. I brought all my family stories over but have more quilting and home organizing projects too! Come check it out at http://www.capturingthethreads.com! 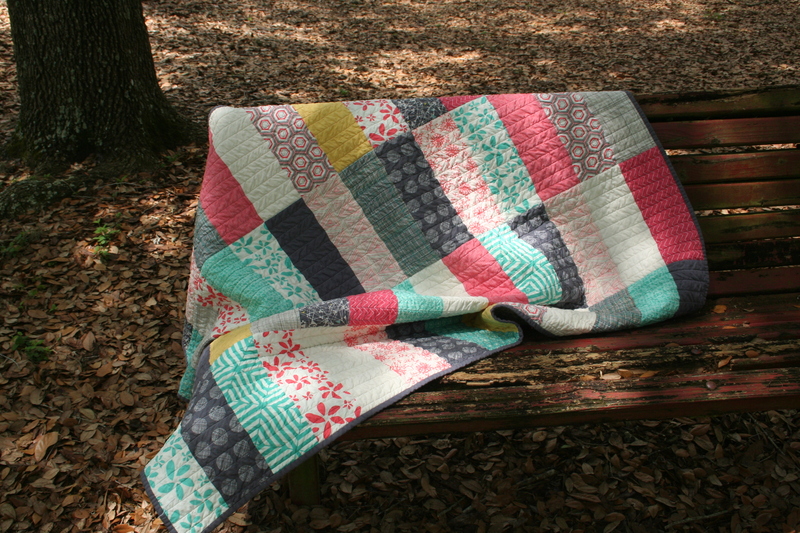 I created this quilt using extra fabric I had on hand from making a baby quilt for my niece last year. My sister asked for coral and aqua colors with some grey. In this quilt I added a few more neutral grays and beiges. I love the simplicity of the rectangles and how the coral and aqua combine with the neutrals for a modern look. 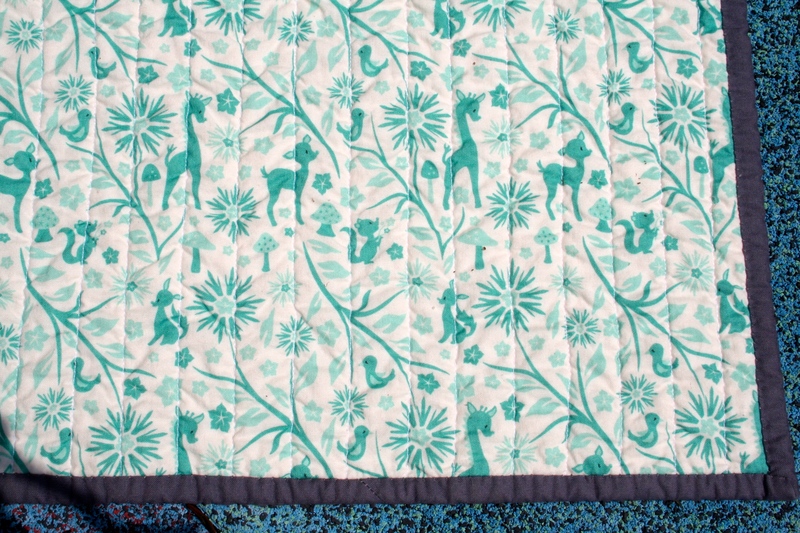 For the backing, I used a Riley Blake fabric with cute little animals on it called Woodland Tails. And, I finally added a label to a quilt! I wrote my own label with a permanent pen and whipstitched it onto the back. I quilted the fabric with vertical straight lines about an inch apart. It’s probably some of the most dense quilting I have done and I love how crinkly and cozy it immediately looked when it came out of the dryer. I headed to the nearest park on my bike one afternoon to take photos. 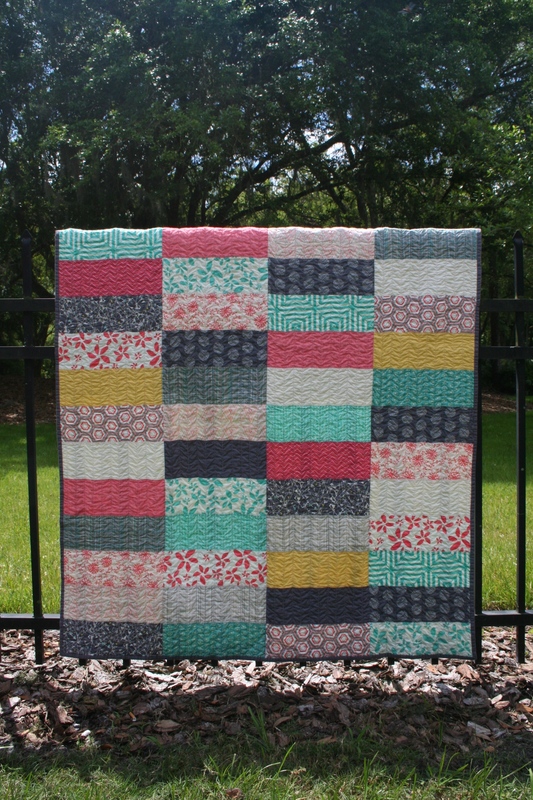 This is the first quilt I’ve taken pictures of in Florida. I took a few pictures of the quilt by climbing on top of some playground equipment and leaning over as far as I could to try to get a square picture. It looked good on the preview but when I tried to rotate it in my editor, it was clear that I didn’t quite get it square. I’m sure the park attendant enjoyed my antics though. 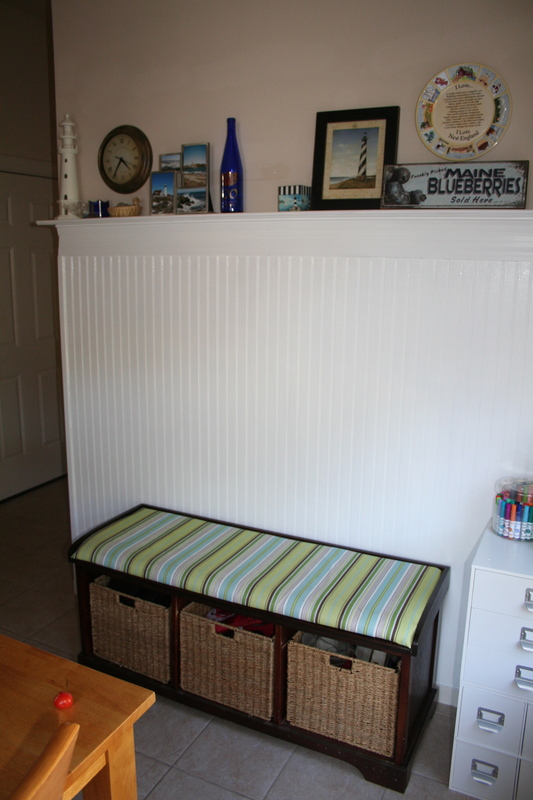 We have a great office space at the front of our house that has become the craft room. It is a big open space with so much potential for use. We have all our craft supplies, office supplies, sewing supplies and school supplies in here and it also acts as a kind of mud room for the kids’ shoes, jackets and backpacks. That is a lot to ask of a room but I think she can handle it. I have been slowly working on getting it in line with my vision, which I seem to tweak quite a bit as I work and live in the room longer. 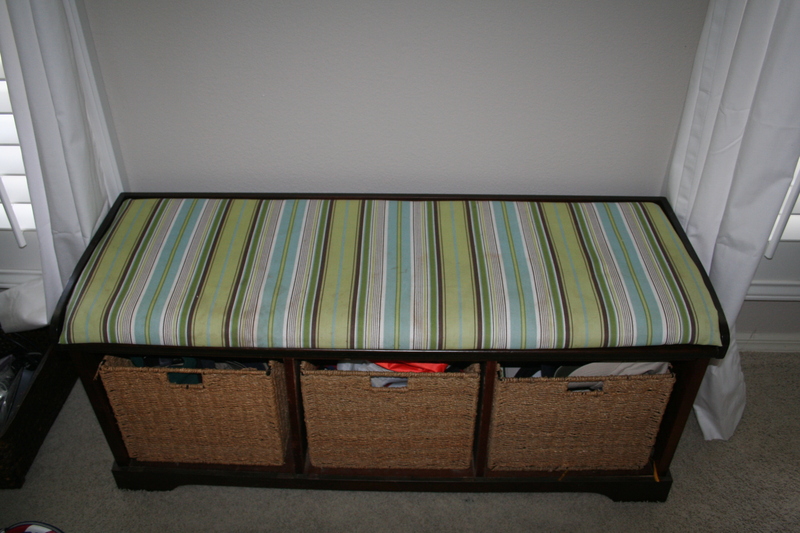 One of the first and simplest things I have done in the room is to hang some of my favorite prints and to update the fabric on a bench seat. I put this green/brown/aqua fabric on in Virginia and it was a much needed improvement over the dirty and orange marker stained original. 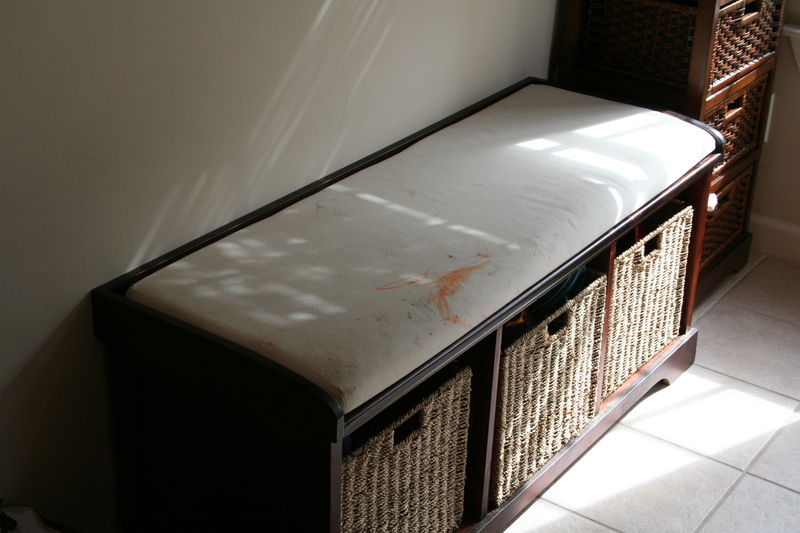 But it had received several years of dog slobber and kid slobber since then and it was time for something new. 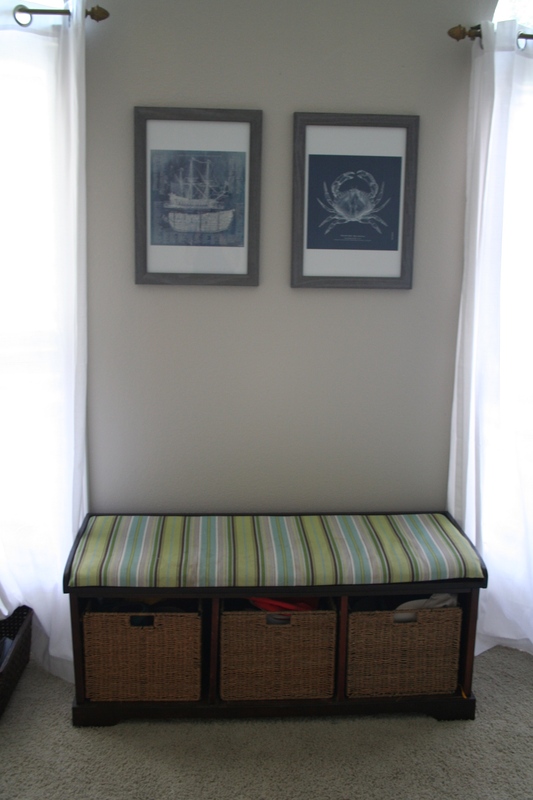 The general theme of the craft room (and actually most rooms in my house right now) is nautical. I spent hours searching through the home decor fabric at fabric.com trying to choose fabric for this room and for some living room window treatments (post to come). I ultimately went with this navy and white chevron fabric from Premier Prints called Diva Chevron Slub Premier Navy. I love how it looks and the color kind of pops against the dark wood and white curtains in here. I picked up the prints from a Zulily sale last year. I loved the crab print and that is what I ordered. But, lucky for me, there was a shipping mistake and they sent me the ship blueprint first, realized their mistake and told me to keep it, then sent me the one I ordered. I found the gray frames at Michael’s. And that is the first peek of the craft room. 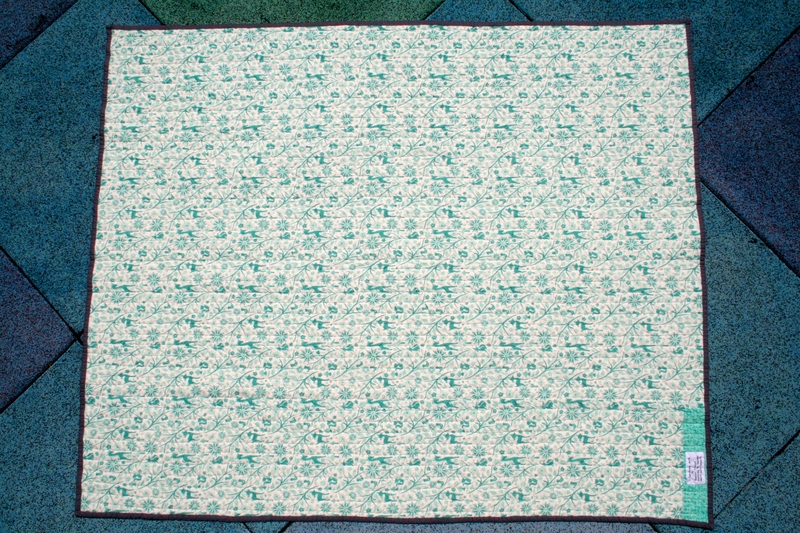 I made this quilt for one of my best friends from high school for her third baby…her first boy! 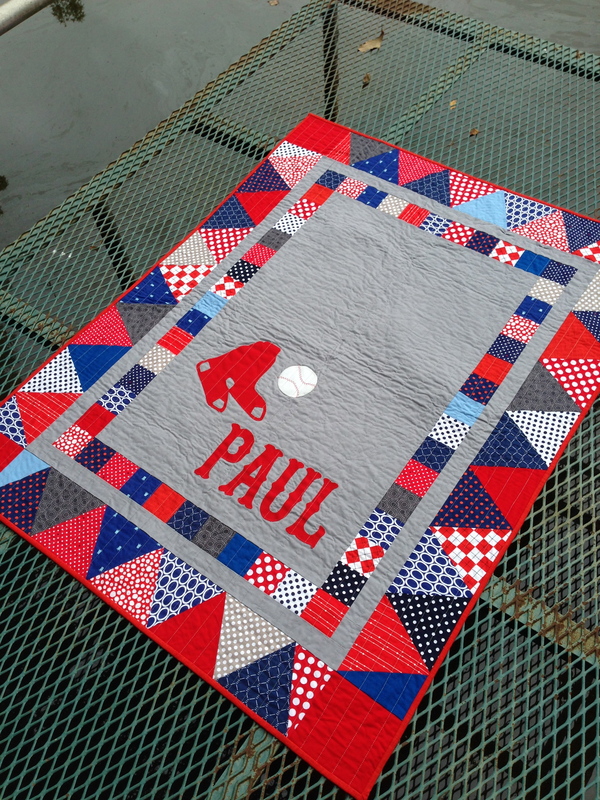 My inspiration was from a Red Sox quilt made by Tracey at traceyjay quilts. 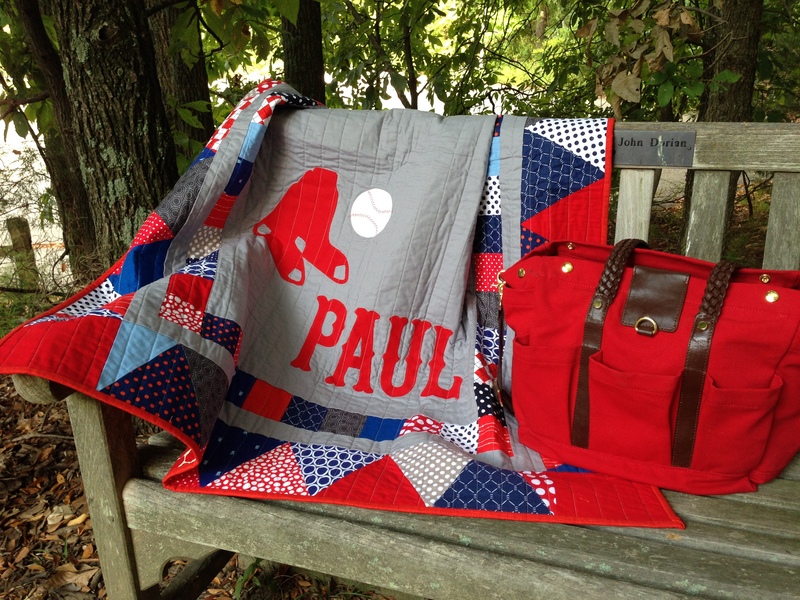 When I saw Tracey’s quilt, I knew I wanted to make one for baby Paul. I grew up in Maine, listening to the Red Sox on the radio on summer nights. And my friend’s husband is from Boston, so they are both Red Sox fans. 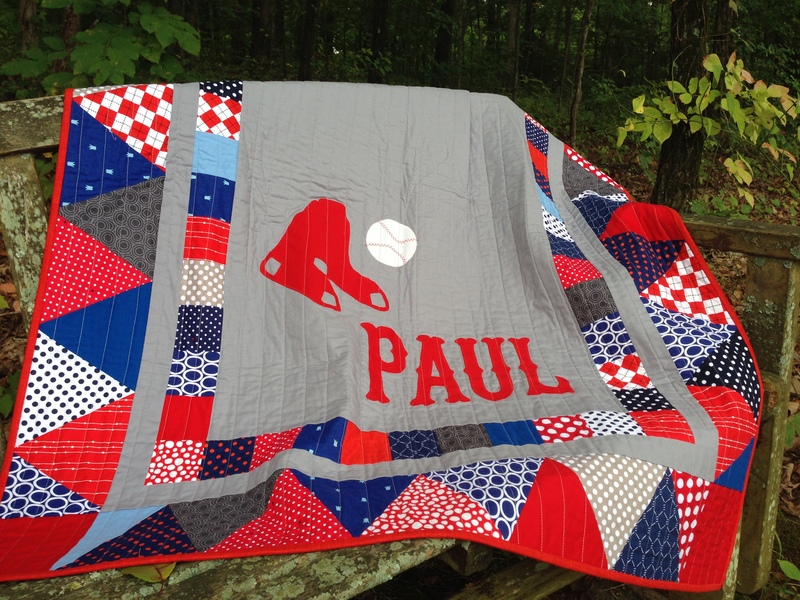 For their little boy, I knew I had to figure how to make this quilt. I ordered a bunch of red and blue polka dot fabrics, figured out how to cut triangles and got to work. The cutting of the triangles was not so tough…it was getting them lined up correctly. This is also the first quilt that I have done appliqué. It was kind of fun once I figured it out! 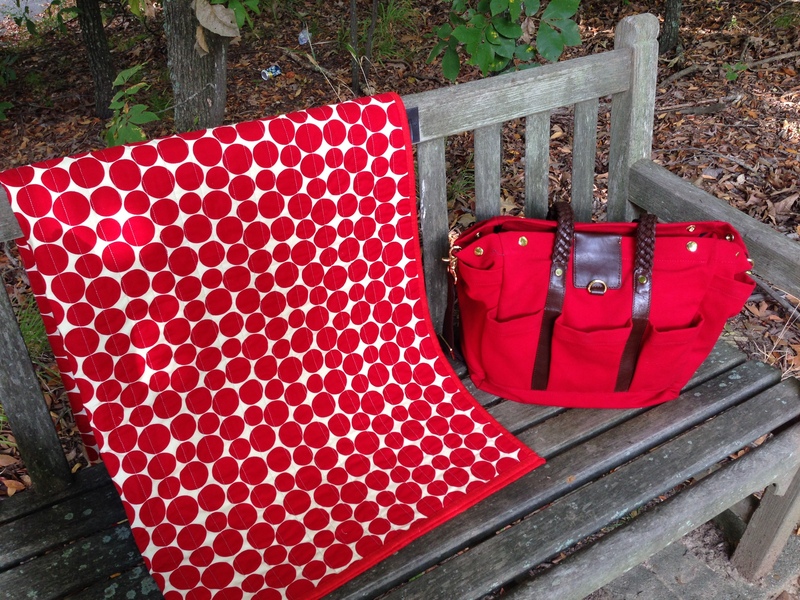 For the backing fabric, I searched a local discount store (Mardens) back home in Maine for something with red and found this big polka dot print. I was excited to add something to the quilt that I found in our hometown. 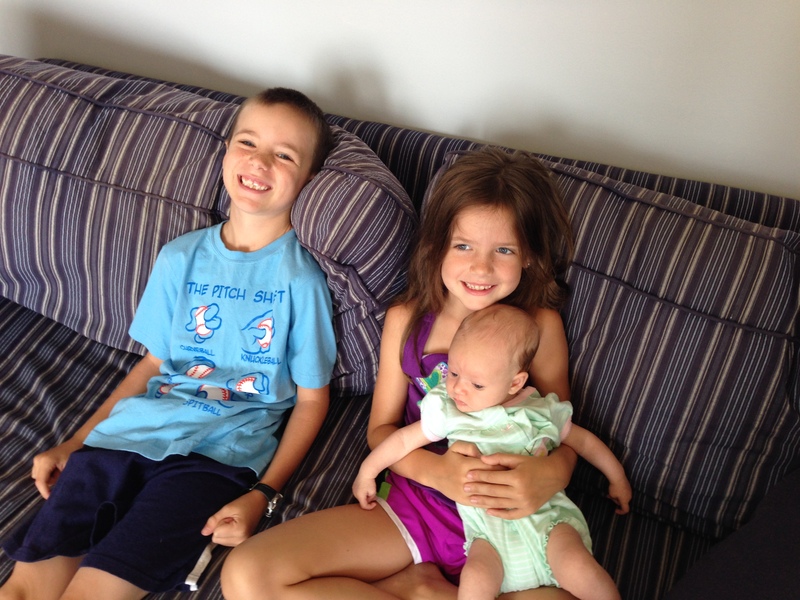 So…this summer after school got out we moved to Tampa, Florida. Then we drove to Virginia and spent a week there. Then we drove to Ocean City, MD and spent a week there. Then we drove back to Tampa. Then we flew to Maine. And this post is a little bit about Maine. 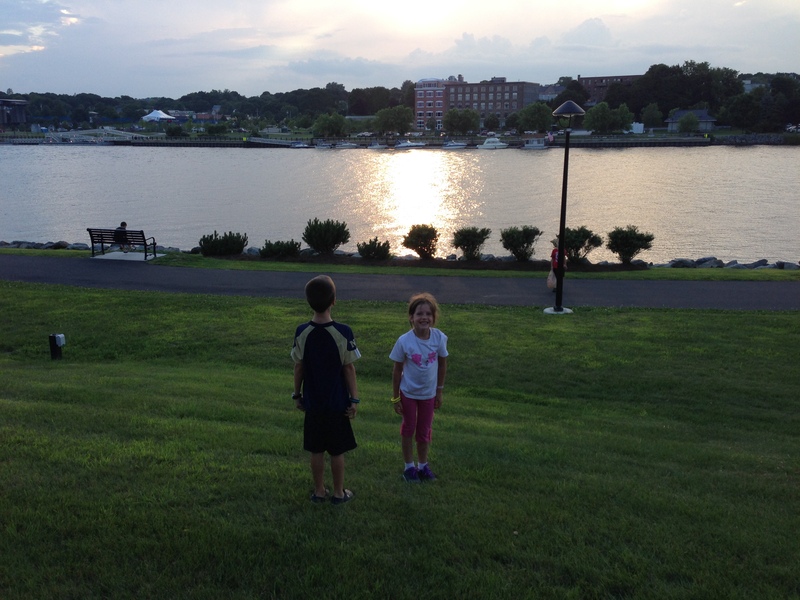 Three hours of iPad and kindle time and we were in Maine by supper time. 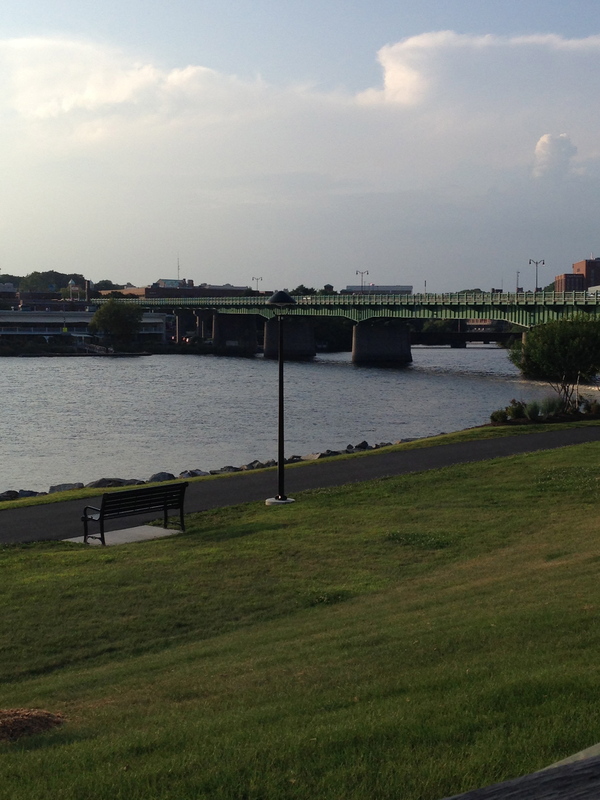 Mum picked us up at the airport and we stopped in Brewer and dined with a great view of the Penobscot River. 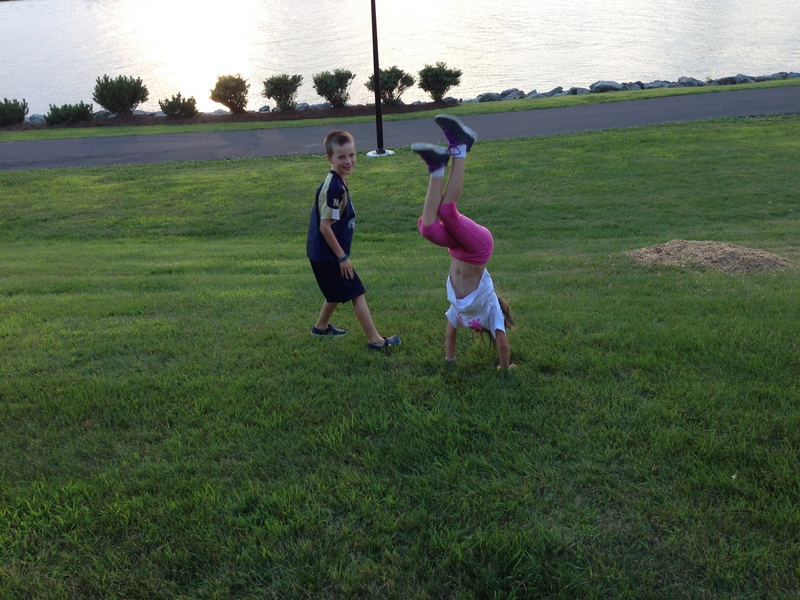 Casey couldn’t wait to show Grammie all of her gymnastics moves and soon enough she had hopped the railing to flip around in the grass. Jack joined her and then they started playing like kids who were cooped up in a plane for three hours. The next day we finally got to meet Miss Cora T Brown. 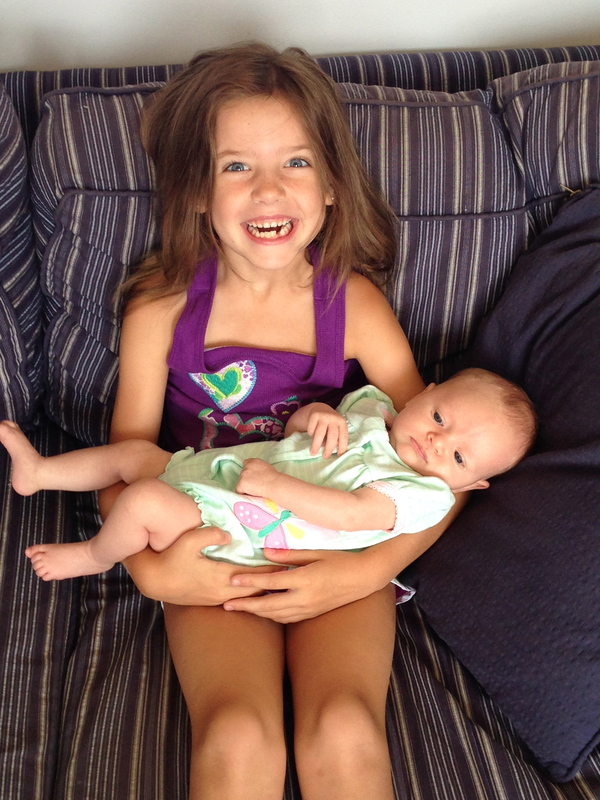 I am lucky to be her Auntie and Casey and Jack are excited to have a new cousin. 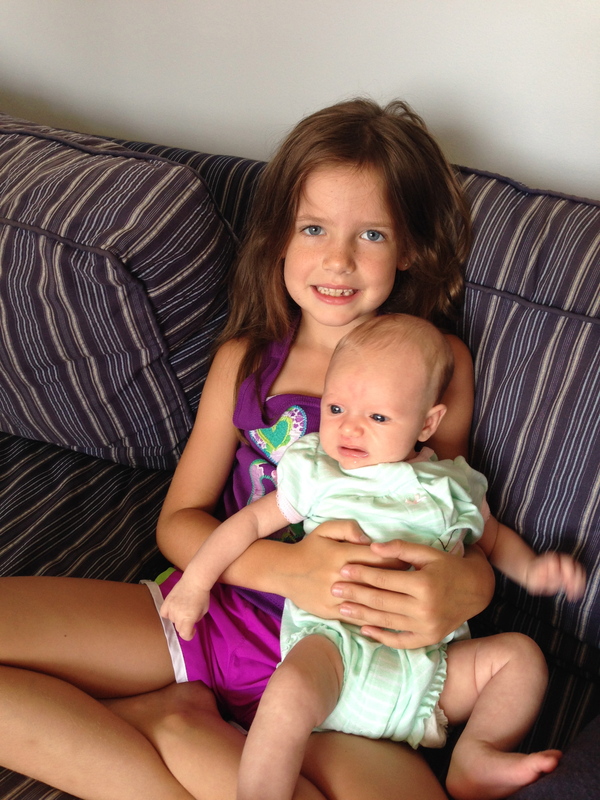 Casey wanted to hold her and play with her and take care of her, in her own special 6 year old way. 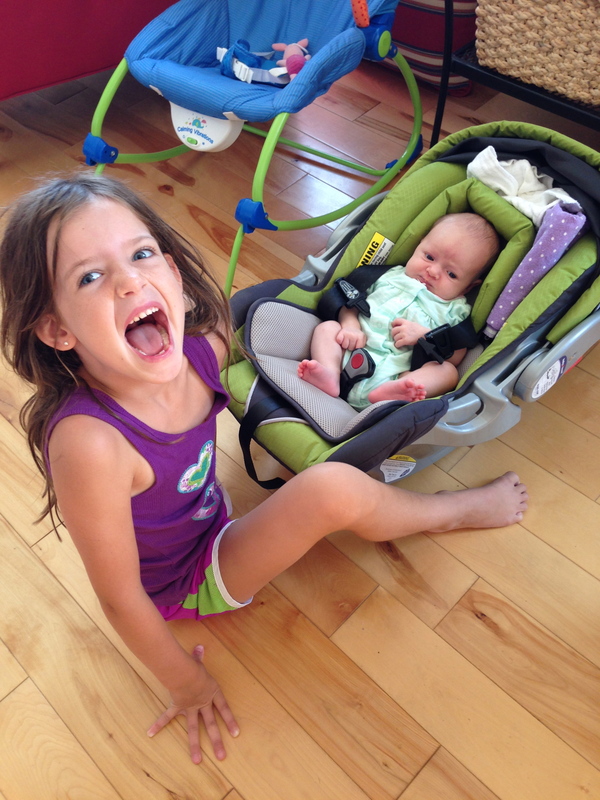 Cora doesn’t like it when she is sitting still, so Casey is working on her “mom bounce” so she can hold Cora a little longer before she starts crying. Cora came out to lunch with us and then hung out in the Wal-Mart parking lot while I purchased some “necessary” items for Casey. About half an hour before we left Tampa, Casey told me she really wanted to learn to crochet and she wanted a crochet hook to bring to Maine. I own one, but I had no idea where it was so it didn’t make the trip with us. Luckily, Wal-Mart provided us with the hooks and yarn we needed and Casey learned to crochet, despite her left-handed teacher. She even brought it to the concert in the park that evening and kept on working on her really really long chain. One day we’ll figure out how to make the second row! That chain came in pretty handy on our last day in Maine, as Casey insisted on wearing pants that were way too big. We wrapped her new “belt” around her about three times and she managed to keep the pants on all day! How do they stay on that [snowboard]? How do they keep going? How do they get up the hill? Is bronze 2nd or 3rd? Are the medals really made out of gold, silver and bronze? Where are the people that are watching them? Is there anybody on the hill? Is that the winner? What does semi-final mean? Is this the second heat? What does 2nd heat mean? Is a sentence a sentence without verbs? Do we want the Russians to win? This is the 2nd Olympics where I really understand what is going on. Casey has moved no less than 4 times in 45 minutes…chair, couch, floor, floor on other side of room. Do figure skaters get dizzy when they spin like that? I can see his skin all the way to his belly. Black is not a good winter color. People shouldn’t wear black here. They cry because they’re so happy they won…they just have to cry a lot. Commercials are for selling things or what can happen or what you don’t want to happen or for movies or for crazy stuff. I think I know why that movie is rated PG. Because he just took that gun and zapped him. So what did they just say? Can you say that different? What is the prize for the teams? Where’s the skiing? I really like the skiing. How long is the longest song in the world? I started reading the first Harry Potter book to Jack & Casey in November. We finished in January and watched the movie. They loved the movie and I think it helped them visualize the magic of the book. Now we’re reading the 2nd book and Jack keeps asking me to read more every night because “we just got to an interesting part!” Jack has been drawing pictures of the characters during his free time at school. Casey is starting to read aloud to me while Jack does his reading. She does a very good job of sounding things out. She gets a little frustrated because she is not reading fast enough to comprehend and sometimes it doesn’t make sense to her, but I’m sure it won’t be long before she’s figuring it all out. For the past several months, it’s been all things Ninja. 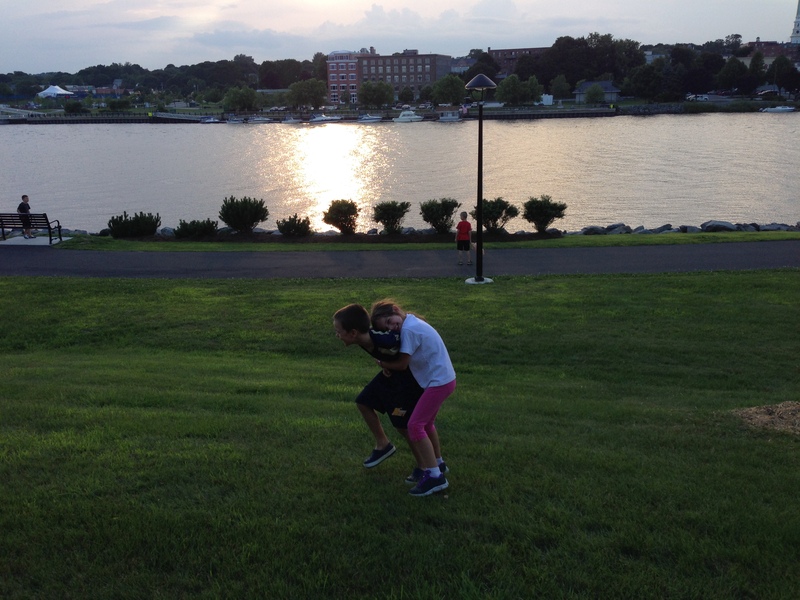 It started when we found American Ninja Warrior on TV one night last spring. Then, this summer they started watching a show called Kickin’ It which is the only non-animated show from Disney I’ve let them watch. I think they’ve seen every episode of every season at least 3 times. We met one of the actors this summer at a fair, standing in line for a good hour for her autograph. And now it’s Teenage Mutant Ninja Turtles. I walk around with the catchy theme song in my head all day. Both Jack and Casey got a Rainbow Loom for Christmas and they make bracelets every day. I love that the “it” toy was only $16 (plus some extra for more bands) and has provided hours of entertainment, even for me. I now get requests to make them surprise bracelets while they’re sleeping. Jack got a Wii for Christmas and has been playing the Lego Star Wars game. He is still into all things Lego and he keeps finding new kinds…Star Wars, Chima, Hero Factory, and Ninja Turtles. I keep trying to find ways to organize them better. Lately it means dismantling sets and putting them in plastic bags although I did find a big plastic bin with dividers in the Christmas section for all his loose Legos. Casey got an American Girl doll for Christmas, whose name is Casey Junior and she has been taking care of her “twin sister” pretty well. She’s already been on a couple of plane rides and to downtown Memphis. They both still love to “craft” and I don’t understand how they go through so much tape. They just make things up – paper airplanes, tiny pieces of paper with staples in it, tiny pieces of paper with tape, brown paper bags with strings attached to papers. They also love when cardboard boxes come in the house. Right now in our house there is an elf house complete with furniture (leftover from Christmas), a garbage eating robot and another garbage eating robot decorated with Christmas items. Since Pat suggested we offer dessert if they eat what’s on their plates without complaint, they have both eaten more variety of vegetables, meat and even some soup. It’s only a few bites of each, but I count that as success. And it’s usually not without complaint…I should probably crack down on that. Offering ice cream for two bites of vegetables goes against every article I’ve ever read about how to deal with picky eaters but it so far it’s working to get them to eat things besides carbs and sometimes they even forget about dessert.